Dundee United manager Robbie Neilson congratulates matchwinner Calum Butcher at full-time. Calum Butcher knows exactly how tough it can be to have another team breathing down your neck in a promotion race. 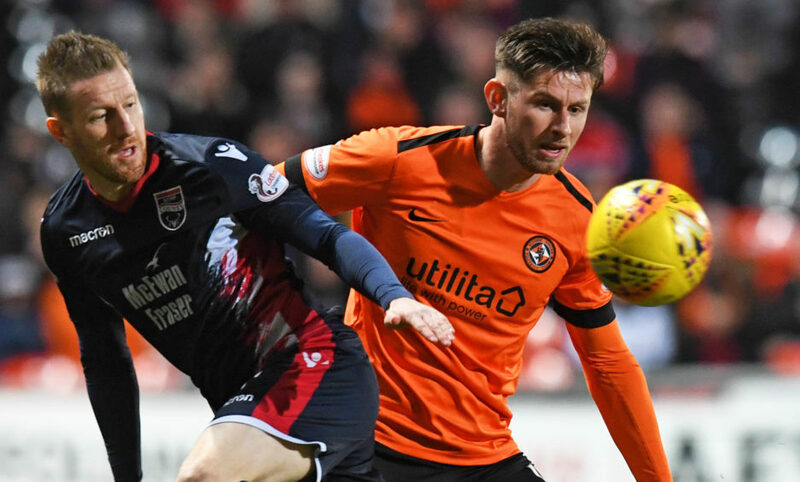 He experienced the stress first-hand when he was with English outfit Burton Albion – now, he is looking to ratchet up the pressure on Ross County with Dundee United. 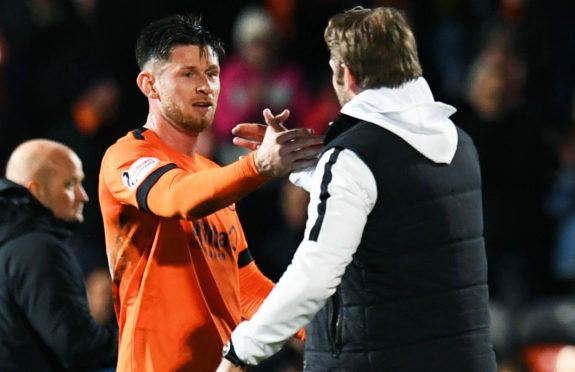 The Tangerines injected life into their Championship title challenge thanks to Tuesday night’s victory over the Staggies, with Butcher netting the only goal of the game in just the seventh minute. 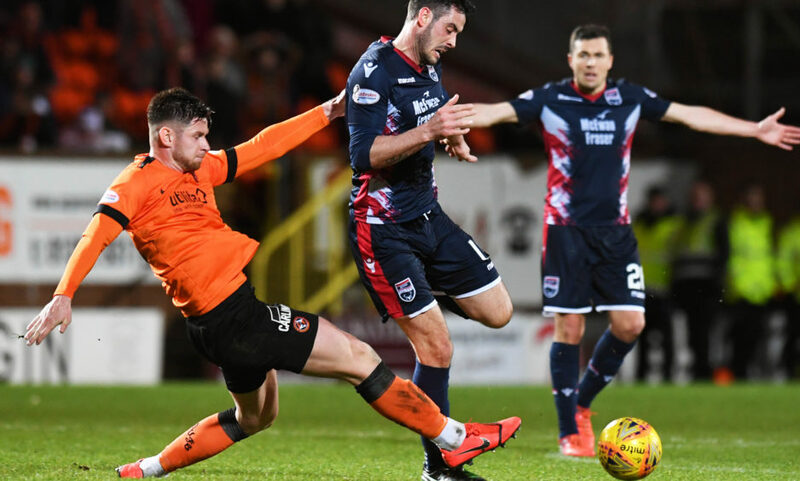 The win cut the gap on league leaders County to eight points with United to play twice – against Alloa on Saturday and next Tuesday at Dunfermline – before the Highland outfit return to league action. If Butcher and his team-mates can win those games, it would obviously reduce the deficit to just two points and really pile the pressure on the Staggies. The 28-year-old midfielder said: “Tuesday was a massive win for us. We needed the three points and now we have two more games before they play again. “We can put massive pressure on them. “If we can get it to two points, I wouldn’t like to be in their dressing-room if that happens. “I know they would have games in hand but that doesn’t mean anything – you have to go and win. Butcher added: “I was in this position with Burton. We were clutching onto it in the end and the pressure was there. Dundee United’s Calum Butcher (L) challenges Ross County’s Brian Graham. “We had games in hand and Walsall were chasing us – it’s tough. “You find yourself looking at the other team’s result and constantly thinking about it. “You are looking for the opposition’s games, people are texting you their results and everyone is talking about it. “It definitely builds the pressure on you when you’re at the top of the league and someone is coming after you. Of course, if County had won on Tuesday, the title race would have been all but over. Butcher admitted the United players were in no doubt about the importance of the game but they now have to deal with a different sort of challenge against the bottom-of-the-table Alloa part-timers. Butcher said: “Ross County would have wanted to come to Tannadice to wrap it up but we stopped that happening. “Would it have been over if they’d won? You would never say that but it would have been very difficult. “It was a must-win from our point of view but we won it and we look forward to the next game now. “It will be a must-win every game from now on, really. “Alloa will be a totally different challenge and in some ways the two games we have coming up are even tougher than the County one. “When the team that are top of the league come to your place you know what to expect. “Now the onus is on us to go out and get the result we need – that’s a different sort of pressure. “Teams might come here and sit in against us, so we will have to find a way to deal with that. “We have to build on Tuesday’s result now – we need to build the momentum. Meanwhile, Neilson is hoping that the two United players who had to come off on Tuesday night, Peter Pawlett and Mark Connolly, will be fit to face Alloa. The manager said: “Mark’s hamstring was tightening up but I think he will be fine. “Peter (groin) we will have to look at over the next few days.